Explore action lets your civilization explore the uncharted regions of the galaxy. Choose one of the unexplored spaces next to a hex where you have a Ship or an Influence Disc and turn a hex tile from the corresponding stack (I, II or III) in it. If you Explore from a hex with only a Ship, it must not be "pinned". the hex must be oriented so that at least one of the Wormholes on the hex connects with a Wormhole on one of the hexes where you have a disc or a Ship. If you have the Wormhole Generator Technology, you may place the hex so that there is only a half Wormhole connecting the placed hex and the hex you Explored from. In the left diagram, when using the Wormhole Generator, placements A, B, C and D would be legal, but E would not. In the diagram, hexes marked with A and B would be legal placements. Hexes in Inner and Middle sectors are laid in circles around the central hex; hexes in Outer sectors may branch outwards. If the hex contains a Discovery symbol, put a Discovery Tile on it face down. 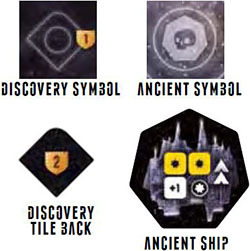 If the hex contains Ancient symbols, put that many Ancient Ship tiles on it, on top of the Discovery Tile. After placing the hex, you may take control of the hex by placing an Influence Disc from your Influence Track on the hex. If the hex contains a Discovery Tile, you may take it when placing the Influence Disc. All Discovery Tiles are double sided: the tile back has a 2 VP value, and the face side has a bonus. Show the face side of the Discovery, and immediately decide which side to use. Tiles that are used as Victory Points are placed next to your Player Board with the side showing the Victory Point value face up. Important: Ancient Ships must be destroyed (see Combat Phase, page 18) before the Influence Disc may be placed and the Discovery Tile taken. 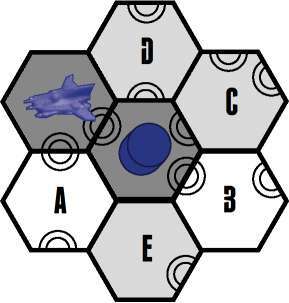 If there are Ships of several players competing for the same hex, the player who eventually gets to place the disc receives the tile. The Center hex contains the Galactic Center Defense System, which must be destroyed before an Influence Disc may be placed. After placing the Influence Disc, you may activate your Colony Ships to place Population Cubes on the Population Squares on the hex. Important: Remember that you may use your Colony Ships at any time during your turn. If the hexes in a stack run out, shuffle the discarded hexes of that stack as a new stack. If there are no more hexes, the Explore action has no use. Influence action lets your civilization conquer vacant hexes or withdraw from hexes. back to your Influence Track. The hex Influenced has to have a Wormhole connection to the hex where you have a disc or a Ship. In the example on the right, you could Influence hexes A, B and G.
After placing an Influence Disc, you may activate your Colony Ships to place Population Cubes on the Population Squares on the hex. During the Influence action, you may turn two of your used Colony Ships face up, even if you choose to move no Influence Discs. If you remove an Influence Disc from a hex, you must also return all cubes from the hex to their respective Population Tracks on your board. If a cube is returned from a gray (wild) square, you may choose which Track it goes to. Similarly, if a cube is returned from an Orbital, you may return it to either the Money or Science Track. Diplomatic relations increase your production and grant Victory Points. Players can form Diplomatic relations when their hexes connect. Diplomacy rules are not used in the two and three player games. If one of the hexes where you have an Influence Disc gets connected through a Wormhole to a hex where another player has a Disc, you and the other player may agree on forming Diplomatic relations with each other. Diplomatic relations can be formed at any time on any of your turns. The connection may happen either by Explore or Influence actions, or at the end of the Combat Phase. There must be a full Wormhole connection, so you cannot use the Wormhole Generator Technology to connect through a half Wormhole. You may not form Diplomatic relations if your Ship is in a hex with an opposing player's Ship or Influence Disc, or vice versa. If you both agree, give the other player one of your Ambassador Tiles and place one of your Population Cubes on top of it. The cube may come from any of the three Population tracks. The Tile is placed on one of the free spaces on the other player's Reputation Track. The other player also gives you an Ambassador Tile and a Population Cube. Place them on an empty space on your Reputation Track. Ambassador Tiles on your Reputation Track are worth 1 Victory Point at the end of the game. Note that your Reputation Track also holds your Reputation Tiles. If the board is full when taking an Ambassador Tile, you may discard Reputation Tiles, returning them to the Reputation Tile bag. You may not have more than one Ambassador Tile from each player. You may rearrange the tiles on your Reputation Track at any time, but you may not discard Ambassador Tiles. Note that the Terrans have one space on the track that may only hold an Ambassador Tile. Your Diplomatic relations stay in effect until the end of the game, unless you attack one of the players you have Diplomatic relations with, or they attack you. Moving your Ships to a hex where the other player has a disc or a Ship is also considered an attack. Both players then return the Ambassador Tiles and cubes to the owner. The cube goes back to a Population Track, chosen freely by the owner. Whenever you attack a player and thus break the Diplomatic relations, you receive the Traitor Card from its previous holder. The player holding the Traitor Card may not form new Diplomatic relations as long as he has the card. Whoever holds the Traitor Card at the end of the game receives a -2 VP penalty. Research action lets your civilization develop new Technologies. 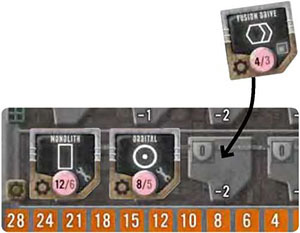 By taking the Research action, you may choose one available Technology Tile from the Supply Board, pay its Science cost (move the Storage Marker backwards on the Storage Track) and put the tile on your Player Board on the track of its category (Military, Grid or Nano). For each Technology of that category you already have, you get a discount shown on the leftmost exposed space on the Technology Track. However, note that for each Technology there is a minimum cost you have to pay regardless of the discount you have. Ship Part: gives the ability to Upgrade this Ship Part. Build: gives the ability to Build this Ship or Structure. Instant: gives a one-time effect when it is Researched. Example: You already have Monolith and Orbital Technologies and you research Fusion Drive. Your Nano Technology discount is -2, but you still have to pay 3 Science, since it is the minimum cost for Fusion Drive. You may not choose a Technology that you already have. The Technologies are kept on your Technology Tracks until the end of the game. They may not be discarded. Terrans and some alien species have starting Technologies preprinted on their Technology Tracks. These are regarded in every way just like the Technology Tiles acquired through the Research action. They may not be covered with other Technology Tiles. Upgrade action lets your civilization modify their Ships. When choosing the Upgrade action, you may modify your Ships' blueprints by placing new Ship Parts there. Each of your Ships functions according to its blueprint described on your Player Board. If you upgrade the Ship's blueprint with new Ship Parts, all the Ships already built are considered to be instantly upgraded. With the Upgrade action, return as many Ship Part Tiles to the Supply Board as you want. Then take up to two tiles from the Supply Board and place them on any of the squares on your Ship blueprints. When placing the tiles, you may place the tiles on top of any of the printed starting Ship Parts on your Ship blueprints, but not on top of other Ship Part tiles. Interceptors, Cruisers and Dreadnoughts must have a Drive, Starbases are not allowed to have a Drive. Taking and returning Ship Parts costs nothing. All values from the Ship Parts are cumulative. 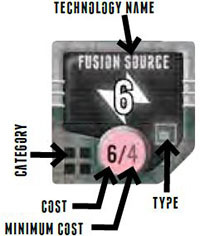 For example, if the Ship has two Fusion Drives, they will give it Movement Value 4, Initiative 4 and Energy Consumption 4. Build action lets your civilization build new Ships and Structures. 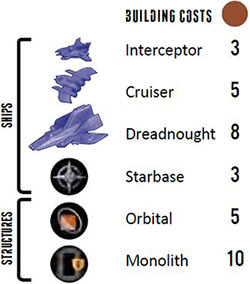 Build up to two Ships (Interceptors, Cruisers, Dreadnoughts and Starbases) or Structures (Orbitals and Monoliths). Pay their Material cost (move the Storage Marker backwards on the Storage Track) and place them in any of the hexes where you have an Influence Disc. Move action lets your civilization move its Ships. The Move action allows you to move your Ships. By choosing the Move action, you may do up to three Ship movements. You may use the movements to move the same Ship consecutively. 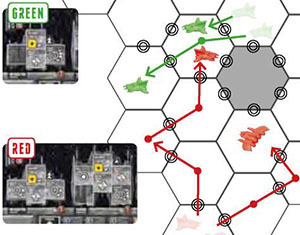 With each move, the Ship may move as many hexes as its Movement Value allows. Movement Value depends on its Drives. Starbases are not allowed to have Drives and therefore cannot move. If you have the Wormhole Generator Technology, you may move your Ships through a hex edge that has a Wormhole on just one side. In the example below, movements A, B and C would be legal. Note the restriction on Movement! The Ships may only move through a hex edge that has a Wormhole on both sides. In the example on the right, movement A would be legal. You may only move to Explored hexes, not to empty space. If your Ships move into a hex, or out from a hex, containing other players' or Ancient Ships, at least one Ship per each opposing Ship must stay (the Ship is said to be "pinned") and engage in combat in the Combat Phase. The Ships exceeding the number of opponents may move. If you later on move or build more Ships to the hex, you may change which Ships are pinned. The original Ships may move, as long as one Ship per each opposing Ship stays pinned. The Galactic Center Defense System ("GCDS") engages all the Ships in the central hex. The hex cannot be moved through before the GCDS is destroyed. Example: Red's Interceptor has a Movement Value of 2 hexes (two Nuclear Drives combined) and Cruiser has a Movement Value of 3. Red has a total of three moves. He moves the Interceptor two times and the Cruiser one time. Green's Interceptors also have a Movement Value of 2, and Green has three moves. When moving, his first Interceptor is pinned by the Red Interceptor. The second one may move through the hex. Finally, Green decides not to use his third move. Reactions can be taken after you have passed. After passing, you may only take a Reaction action when it is your turn in the player order. A Reaction is essentially a weakened version of a Move, Build or Upgrade action. UPGRADE : you are allowed to return as many Ship Part Tiles to the Supply Board as you want, and then take one Ship Part. BUILD : you are allowed to build one Ship or Structure. M0VE : you are allowed to move only one Ship once. 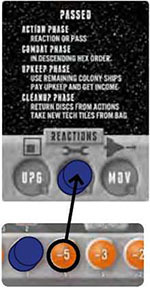 A Reaction is taken by placing an Influence Disc on the Reaction Track on your Summary Card. The Nanorobots Technology does not give you an extra build when taking a Reaction.